I am sending you the picture of Mr. Jure Sterk, S52YS/MM on his sailboat "Lunatic". As he told me you asked him for his picture. So I hope these would be OK.
Posted by Alberto Mattei IT9MRM @ Italian Navvy. For those who wish to contact Jure S52YS/MM it is possible to listen for him all Fridays, Saturday and Sunday from 07:30 to 08:30Z on 14350 MHz SSB. QSL info is S52ID. nachdem wir von Yure ein paar Tage nichts mehr hörten, rief ich einen bekannten OM, VK5HK, in Australien an und schilderte ihm die Situation. Er versprach daraufhin mich zu informieren, falls er neue Infos bekommen würde. Yure hatte sich im australischen Travellers-Net gemeldet, hatte irgendwie Probleme mit den Australiern bekommen und ist dann Richtung Tasmanien abgedreht. Ungefähr 400sm vor Tasmanien muss er in einen Sturm geraten sein und den Mast verloren haben. Er wurde dann von offizellen Stellen zum Tasmanischen Yachtclub in eine Marina geschleppt und ist wohlauf. Das muss vor ca. 3-4 Woche passiert sein. Hab mich mit einigen Tricks in die Whitelist von Ted auf WINLINK reingemogelt. Er ist Betreuer von Jure S52YS. Mal sehen, ob er weitere Infos schickt. A few days ago we heard from Tonys net, New Zealand, 14315@2115UTC. Jure was near Mauritius, still sailing at 4 knots, heading for New Zealand! Will try to get more clear information Tuesday. I will pass your 73's to Jure today if conditions allow. Betrieb: qrv waren DH5PP Rudi; DL6RDJ Herbert; S52YS Jure; OE1SJB Hannes; OE6HAF Hannes; DL1HXB Jutta; Gast DL9JM; DF3JQ Georg. Richards Bay,Süd Afrika.S52YS Jure meldet Pos.37°24S und 19°30E alles ok.
OE2FCO Christina Pos.37°24N und 03°47E Richtung Gibraltar. OE1SJB Hannes Kurs Kanaren. DL1HXB Jutta Algave. I will pass your 73's to Jure S52YS today if conditions allow.He has a broken fore stay and may have to abandon his non stop trip and goin to Albany for repairs but he will make that decision when he gets closer to Albany. Very sad. Jure versucht, eine Strickleiter zu bauen mit der er in den Mast klettern kann, um mit einem Stück Draht mithilfe von Seilklemmen das Vorstag zu reparieren. Problem dabei sind unterschiedliche Durchmesser von 7 und 8mm. Außerdem sind seine Essensvorräte zum Teil vom Seewasser verdorben. Er hat nur noch ein Funkgerät betriebsbereit und die Stromversorgung wird eng. Seine Frau hat ihm sehr strenge Worte übermitteln lassen, er hat aber ebenso geantwortet, daß er weitermachen will um die letzten 5 000 Meilen zu schaffen, nachdem er bereits 24 000 Meilen hinter sich gebracht hat. ZS2ABK,Graham, SA.MM.Net schreibt: Pos. 37°50`S 98°31`E "all well"
10 METRE YACHT LUNATIC / S52YS WITH 1 PERSON ONBOARD LAST REPORTED IN POSITION 37 46S 099 36E AT 010625 UTC JAN 2009 UNDER JURY RIG MAKING FOR ALBANY (35 03S 117 53E) AT 2 KTS. VESSELS TRANSITING THE AREA ARE REQUESTED TO KEEP A SHARP LOOKOUT AND REPORT ANY SIGHTINGS OR CONTACT TO THIS STATION OR RCC AUSTRALIA VIA TELEPHONE +61262306811 INMARSAT THROUGH LES BURUM (POR 212,IOR 312), SPECIAL ACCESS CODE (SAC) 39, HF DSC 005030001, EMAIL: rccaus@amsa.gov.au OR BY FAX +61262306868. I'm very sorry to Jure. We know him for several years. We lose him a love of amateur radio and very good sailor. I last had contact with him on the 1st January 2009.
coming to light. Agencies involved have been notified. wahrscheinlich auf See verschollen ist. April23'2007@2130UTC - 36deg31S, 173deg37W, Steering 265@4knot, SE15-20 Good spirits. Looking forward to Tauronga and looking for a tow into harbour as no engine. 18April Aprox posn 40deg22S, 167deg40W steering 030@2kn with NW20. Heading for Tauronga NZ dueto rigging failure. Using 40m approx 7095lsb at about 2020 to 2030UTC. Pictures 12th April. Updated 12April aprox posn 42deg22S, 175West. I talked to Jure 2130Z on Weds28March2007, his position 48.12S,157.12E Making 4knots on 110T with NW 15-20knots and fine wx. He asked for wx information off the internet because a low was comming up behind him. We noted information from USN fnmoc site and also NZmet site [not working properly]. Suggested wx was N gale in next 12hours with heavy rain in front. After moderating winds of SW to NW over next 4 days. Expect to talk to him on Tony net 14315 at 2130zulu. If you look up s52YS on the internet you will find a lot of posts but not much information. Yacht is a 30ft sloop, called Lunatic. Sloop is a Miura design from South Africa by a man called Berkemieir or Berkemayer. This information from Christian zl1diy who is now relaying wx to Jure on either 14315 or 10125 or 7092 at about 2120Zulu. 12April 2007. If anyone has any further information please contact me and I will update this site. My email is on qrz.com. To vk2ezq, 12 March 2007. HI TED Here are the photos you were after. If you don't know the story, Yuri want's to be the oldest person with the smallest boat to sail non-stop round the world . He departed S Africa, but had to call into Hobart as he lost his forestay, and had a few rudder problems. He has now replaced the lower rudder bearing and has a new forestay. Unfortunately the engine is no good, so he took the prop off. I got to meet him, when the net had trouble finding him off the Tassie W. Being retired, I was able to drive him around getting parts, and doing his big food shop, etc. Due to his calling in to Tassie for repairs, he now has to start his challenge from here, so I wish him lots of luck, and look forward to buying him a Rum n Coke (his favourite) on his return to Hobart. Cheers 73s John VK7ZZ. Marcel is asking for a search. Lunatic will likely drift towards Tasmania but may go as far as New Zealand before hitting land. 1. The longer the drift is the less precise the position. 2. Predicting the direction of drift of a log in the ocean is very imprecise. This Lunatic is not a log as it has windage. Maybe contacting yacht clubs along the south coast of Australia and Tasmania may help. The western Victoria state coast is called the "wreck coast". This is a possible place where Lunatic will drift. Please could you get Marcel direct email address please. Dear Bernd,  Have I got Marsell email correct? Are these aerial photos of LUNATIC mentioned by Marsell on the internet? Marsell is asking for a search. The RCC position is due West of Perth,  Perth is 32d02S, 115d44.64E. Lunatic will now likely drift to the West Australian Coast somewhere N or S of Perth. I do not have precise information on currents and winds. The wind is the most likely driver. John Anderson may be able to help with a prediction. LUNATIC could be sailing at an average speed of 1knot? 2. Predicting the direction of drift of a log in the ocean is very imprecise. This Lunatic is not a log as it has windage and a keel and it will sail around. The windage is unknown. Currents in the ocean around Australia are erratic. Maybe contacting yacht clubs along the WEst and south coast of Australia and Tasmania may help. Also fishing boat cooperatives. And Amateur Radio Clubs, Fishing Clubs, CB radio operators, Coast Guard etc. The other possibility is an Australian yacht following Jure. But he was heading for Adelaide with 2 onboard. He has callsign vk?f??? Warren vk4fwh was talking to him on 1Jan but we cannot get Warren on email and he is not on tonys net at the moment. Probably the Australian yacht is south of Australia and therefore not near LUNATIC. Information For Dave:  zl3dm. This looks like the latest that we have. Dear Bernd, Ideas to help Igor and Marsell. i forwarded your mail to Ted VK2EZQ. Here is his answer. I gave him also your emailadress.I think he will contact you directly. Ted coaches the qrz.com-side of Jure. If you will mail him, put a // in subjekt at first because winlink forwards only then. The hope is dieing at last. Position for Lunatic was Latitude 32-18.0S, Longitude 091-07.0E. at April 30, 2009 5:43 a.m.
Posted by unregistered user at 4/30/09 12:57 p.m. The sailor was Jure ©terk from Slovenia, Europe. Posted by unregistered user at 4/30/09 1:27 p.m.
... he was my fellow countryman, a 72-years old lone wolf, always sailing alone... his name was Jure Sterk, right now I'm holding in my hand his first book, titled "Roulette on Atlantic", written in 1985, about his first solo attempt to cross the Atlantic ... circled the globe many times since then... I had an honour to shake his hand, almost twenty years ago, just after returning from his, as he said, the most important voyage, single-handed around the globe in a tiny, 6-meters long vessel called Slovenia, to celebrate the first anniversary of his country. Posted by unregistered user at 4/30/09 2:49 p.m.
Pat thank you for your post, and please thank your brother for those images and his thoughts. Posted by unregistered user at 4/30/09 3:05 p.m. The name of the boat is "Lunatic Piran" and not Lunatic Pirate. Piran is an old city at the sea side in Slovenia. Posted by Sister Patricia at 4/30/09 8:51 p.m. Thank you for your comments and updates about this story. I was hoping it would provide a little more background. So good to have a face and a name and a life to complete this story. Thank you, Matjaz for your comment about sharing this story being the right thing to do... because we were a bit hesitant about it - but it seemed more good would be done by sharing than not. I do appreciate the links - and I saw that the boat's name was actually the Lunatic Piran from the video. I hope perhaps even more bits and pieces will come to this story. This morning we prayed for Jure Sterk at Mass. From the pictures in the video he looked like a very good and life loving person. Posted by unregistered user at 4/30/09 10:32 p.m.
Posted by unregistered user at 4/30/09 11:02 p.m.
Three times he attended Minitransat transatlantic race (Transat 6.50) after the boat with eight time Atlantic Ocean, Indian Ocean twice, once the Pacific, between the years 1991-1994 is around the world on the sailboat, only 6.5 meters long. Most boats were made by himself . In their ventures, the five  fall into the sea, the four seriously injured or lost a rudder, is also five times harder stuck, a sailboat is always resolved without foreign assistance. In December 2007 it was abolished in sailing around the world to start and end in New Zealand. 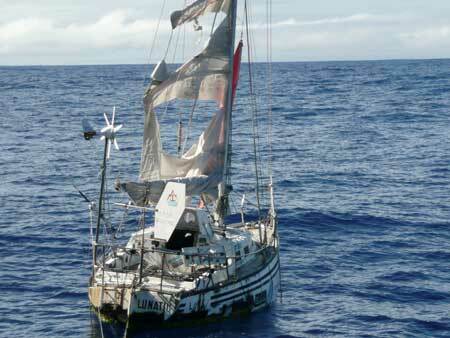 Via radio links, the last answer 1st January 2009, 27 January have seen his boat damaged and apparently abandoned in the Indian Ocean about 1,000 miles off the coast of Australia. It is currently missing. Šterk is an honorary member of the Club sailing Ljubljana, Portoroz, and a member of the British YC cruising Ocean Club, the largest sailing club in the world. He is also a master of Judah (1. day after the Kodokan) and radioamateur (with call sign S52YS). Posted by unregistered user at 5/1/09 2:43 a.m.
A sad story....A very brave sailor. Posted by unregistered user at 5/1/09 5:17 a.m.
What a sad but nice story about this sailor. I am sure he will be remembered more since you posted all this. Thanks Sr. Pat I love your stories. Posted by AnneMary at 5/1/09 5:38 a.m. Thank you forposting this Sr.Pat. It brings to mind so many spiritual and personal thoughts. I am sure that as this this man sailed alone, he was called as the apostles to be one with Christ. May he now have seen the face of God. Have a gentle and happy weekend! Posted by unregistered user at 5/1/09 5:49 a.m.
Posted by Emmi Hyvarinen at 5/1/09 6:31 a.m.
IIRC, the Lunatic Piran was first found abandoned off the coast of Australia back in February. Posted by unregistered user at 5/1/09 6:34 a.m.
Posted by unregistered user at 5/1/09 7:12 a.m.
Posted by unregistered user at 5/1/09 2:17 p.m.
Posted by unregistered user at 5/2/09 2:33 a.m.
January 2009 logbook for future weather entries-this shows me that Mr Sterk was lucid and planning ahead for days to come. I think he had an incident on the 2nd or 3rd of January 2009. We have notified the Australian Coast Guard and Slovenian embassy but have got no reply. I read that Mr Sterk has a child. If this is so, it would be nice if someone got the word out to them so we could return the photos and logbooks to them so they have some kind of closure. There was no liferaft canister found on the outside of the sailboat. Posted by unregistered user at 5/2/09 6:59 a.m.
PLs consider to get the family alerted. It is the work of charity and the lord will reward. Posted by Irish Colleen at 5/2/09 10:11 a.m. Thank you Sr. Pat and your brother too for sharing this sad but beautiful story of a man dedicated to what had to be a passionate love of the sea and sailing. I sincerely hope that someone can bring in the Lunatic Piran to a safe shore and repair any damage done by the elements to her. It would be a fine tribute to her Captain. I pray he is on the sunny shores of Heaven, a very safe harbor, and we can all meet in eternal time. Posted by unregistered user at 5/2/09 10:17 p.m.
Just love the quote for May 1st, how true and I will try to remember it especially in tought times. Posted by unregistered user at 5/4/09 11:28 p.m.
this made sailinganarchys front page. mixed emotions, obviously an old sailor who loved the sea, and probably couldn't think of a better way to go. Posted by unregistered user at 5/5/09 12:40 a.m.
Posted by unregistered user at 5/5/09 1:13 a.m. I had lunch with Jure in Vieste sept. 04, his last stop heading Gibraltar for another round the world cruise. He was incredible and I remember him telling about his ropes out of board and how many times he fell in water and returned on deck thanks to those ropes: I believe he perfectly knew that one day, these ropes, would not save him. He was the perfect optimist, taking a huge risk (that repeated becomes a certitude) but smiling at this fate, happy to have been able to sail all of his life. I'd like to know what is of his boat: maybe some of us could put some money together to bring it back home in Piran and restore it in order to remember one of the greatest sailors of this past century. Posted by unregistered user at 5/5/09 2:06 a.m.
Hi My name is Fred from Tauranga New Zealand.Jure and his yacht Lunatic was in the Bridge Marina preparing for the voyage,he left Tauranga in Dec 2007,his course was across to Cape Horn up around the Azores back around the bottom of Australia ,Tasmania, across the Southern Ocean around the bottom of New Zealand thence up to Tauranga to complete his voyage to become the oldest sailor in the smallest yacht to circumnavigate the world. Jure had touched the lives of many Kiwis ,he was a well respected quiet unassumming sailor.Jure removed the heavy old motor from Lunatic allowing more room for essential food. 'Won't be needing the motor,I'm sailing non-stop," he said with a grin. It is not often you are able to get alongside an adventurer of the calibre of Jure.His wise counsel,his thought provoking philosphies combined with a sharp wit endeared him to all those who took the time to be in his company. May your Spirit soar with the majestic wandering Albatross of the great Southern Ocean. We will remember you my friend. Posted by unregistered user at 5/5/09 2:31 a.m.
.... that 1.01.09 up to now the last contact was. 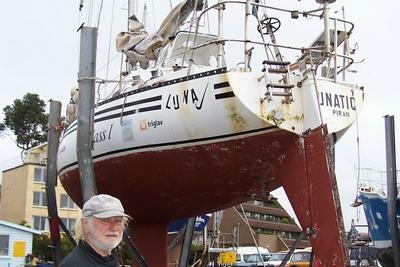 Jure wanted to rise in his Dinghy to clean the underwater ship of his "Lunatik". Posted by unregistered user at 5/5/09 11:17 a.m. It is a sad story. I hope some could bring the "Lunatic Piran" in, or give her a Viking's funeral, so she does not cause a accident. Posted by unregistered user at 5/5/09 3:25 p.m.
Posted by unregistered user at 5/5/09 10:31 p.m.
Posted by unregistered user at 5/6/09 2:41 a.m.
Hey guy thank you for everithing (information, pictures, details and first of all tanks for the stop at the Lunatic). Our government again drop the test with her inactive main role at the topic. We all know that Jure is missing from the start of this year. They didn't even contact Australian's about that we are missing him. Thank you guys for your effort and for the infortant information what is going on with Lunatic. Posted by unregistered user at 5/6/09 5:04 a.m.
Beatufifull story.. Very sad, thats true.. but buautiful. I've never heard about him, but the things i could read about it really touch me. Rest in Peace, Jure. Posted by unregistered user at 5/6/09 6:07 a.m. I've read the blog ... and all the touching, heartfelt descriptions of the abandoned sail boat. Posted by unregistered user at 5/6/09 9:11 a.m.
Posted by Sister Patricia at 5/6/09 8:43 p.m.
comment from Sr. Patricia. - I think this posting has been the most important posting I have ever done. And the beauty is that I merely shared what I received and others shared what they had to give and it has resulted in a beautiful tribute to Jure Sterk. Just shows how connected we all are - even when we can't imagine we are. Posted by unregistered user at 5/6/09 10:36 p.m. I am standing upon the seashore, a ship at my side spreads her white sails to the morning breeze and starts for the blue ocean. She is an object of beauty and strength. I stand and watch her until at length she hangs like a speck of white cloud where the sea and sky come to mingle with each other. Then someone at my side says "There she has gone!" Gone where? Gone from my sight, that is all. She is just as large in mast and hull and spar as she was when she left my side, and she is just as able to bear her load of living freight to her destined port. Her diminshed size is in me, not in her. And just at the moment when someone at my side says " There she has gone!" , there are other eyes watching her coming, and other voices ready to take up the glad shout;" Here she comes! Posted by unregistered user at 5/7/09 10:49 p.m.
Posted by Kathleen6455 at 5/7/09 11:04 p.m.